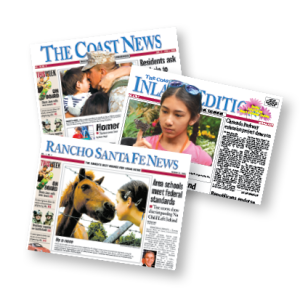 Reach over 100,000 affluent readers through The Coast News Group. The Coast News Group is locally owned. It was started 30 years ago by a single father with a 3 year old son who is now the assistant publisher and sales manager. Our roots run deep. We really care about the communities we serve. We care about our readers and our advertisers. We are dedicated to making your ads work. We have many advertisers that have been with us over 25 years – true testimonials to the results we can bring to your business. Our graphics and editorial people are the best in the business. Our office walls are covered with editorial excellence awards. It is no brag to say our papers are among the finest in the USA at this very moment. Have a question? CLICK HERE to contact the ad department.The deadline for Rancho Santa Fe News is Friday at 5 p.m. The Coast News deadline is Friday at 5 p.m. Spot color is $150. Four-color is $6 per column inch, up to a maximum of $300.